When people talk about local music one name is sure to always pop up, John Foreman. 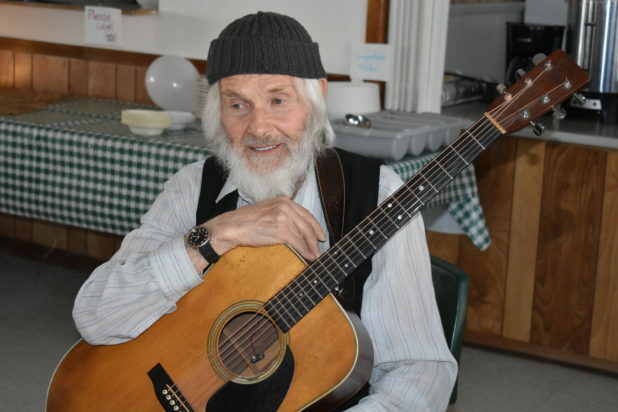 Foreman celebrated his 80th birthday with friends, family and fans at the Lake St. Peter community centre on Saturday, March 23. Music has always been a major part of Foreman’s life. Even when out doing log hewing demonstrations he always has a penny whistle sticking out of his jeans pocket ready to give a happy little tune to those passing by. Foreman’s work to honour local heritage and music has been recently honoured. It has been announced that Foreman is to be inducted into the Land o’ Lakes Traditional Music Hall of Fame. The hall of fame honours local musicians who have put in years of work sharing their love of classic country, blue grass, Celtic and ‘50s and ‘60s bebop music. The hall of fame is not housed in a physical building, but has a website and some memorabilia from the inducted members that are offered to museums in Tweed, Napanee, Cloyne and Hartington. The inductees receive their honourary plaque at the annual induction ceremony at the Flinton Jamboree, which takes place on Oct. 5 this year. The goal of this is to honour the performers who have contributed significantly to traditional music in the three counties of Frontenac, Hastings and Lennox and Addington.